Believe it or not, Robert Montgomery Knight has been working as a college basketball analyst for ESPN for six years. When he was hired in 2008, Knight joined ESPN as an immediate headlining act. He was used as a top analyst both in the studio and in the broadcast booth, even breaking down film for special segments. 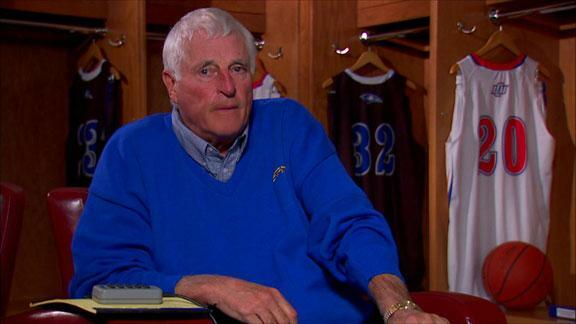 But the shine soon came off Knight’s television career as it was discovered that, well, he was Bob Knight. And maybe being a congenial television personality wasn’t exactly in his nature. Now after six years, ESPN will finally be parting ways with the former national championship winning coach. According to Richard Deitsch at Sports Illustrated, Knight will call his last game for the network tonight as ESPN will not be renewing his contract after the NIT Championship Game. On Thursday night, his run as a one of the “damn people from television”—at least as far as a being a damn person from ESPN—is officially over. SI.com has learned ESPN will not renew its contract with Knight. His last broadcast for the network will be Thursday night’s NIT’s championship between Stanford and Miami, which tips at 8 p.m. ET. – Appearing to fall asleep on set. – Getting confused over the shot clock. – Screaming at fans to sit down on the air. All things considered, this news is probably a couple years late for ESPN. Knight has been sliding down the broadcast ladder in Bristol, culminating in calling games from the American Athletic Conference this season. Think about it – when was the last time you actually saw Knight on ESPN? I seriously can’t recall. Knight is literally about the 837th most visible person at the network at the present moment. There have been notable busts when it comes to prominent coaches or athletes trying to make the transition into broadcasting. But the prolonged decline of Knight at ESPN has been truly unique, especially considering his name recognition and what he accomplished in the sport.